We left California behind, entering Oregon for the second time in our lives, having previously spent a few days in Portland for a major beer fest. This is our first time here with an RV, however, and we look forward to several weeks of fantastic motorhome adventures. 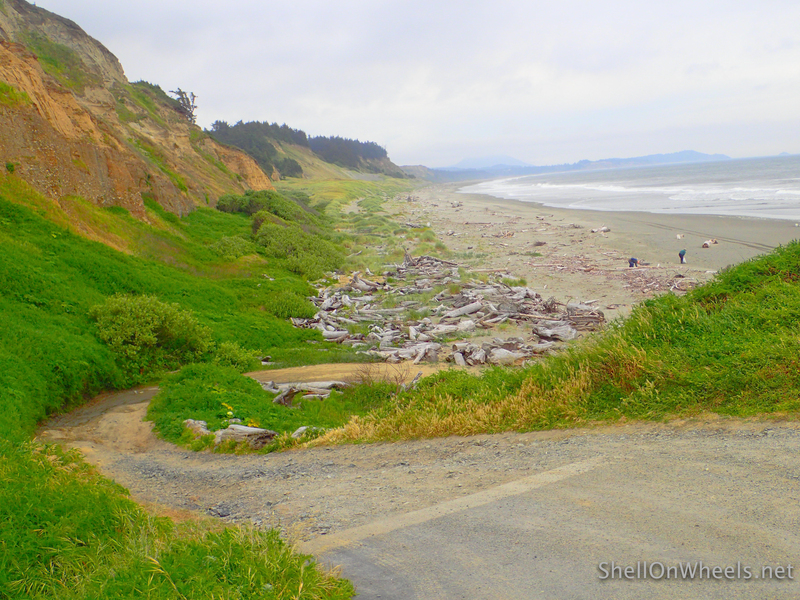 Oregon is high on the must see lists of many RVers we follow on line, and from their descriptions we became particularly enamored with the coastal region. We have selected a handful of areas along the coast we would like to see, spread out by a hundred miles or so between each, with back up options in case our primary choice is full. The great thing about Oregon is how many fantastic and generally affordable options we have. Take a look at this map of state parks; amazing how many are on the coastline, and that doesn’t even include the private park options. 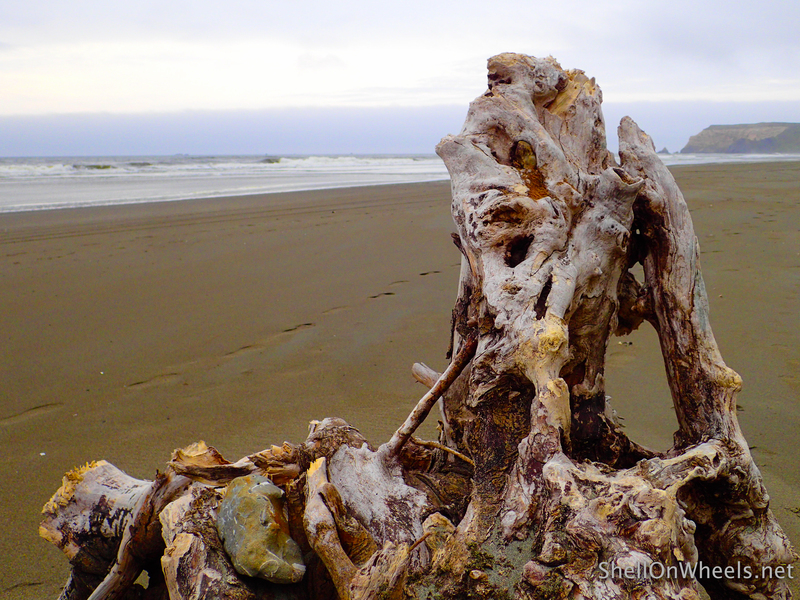 Even if we only take the top coastal recommendations from, say, Wheeling It’s years of travelling through Oregon, we would have too many to see in our time here. 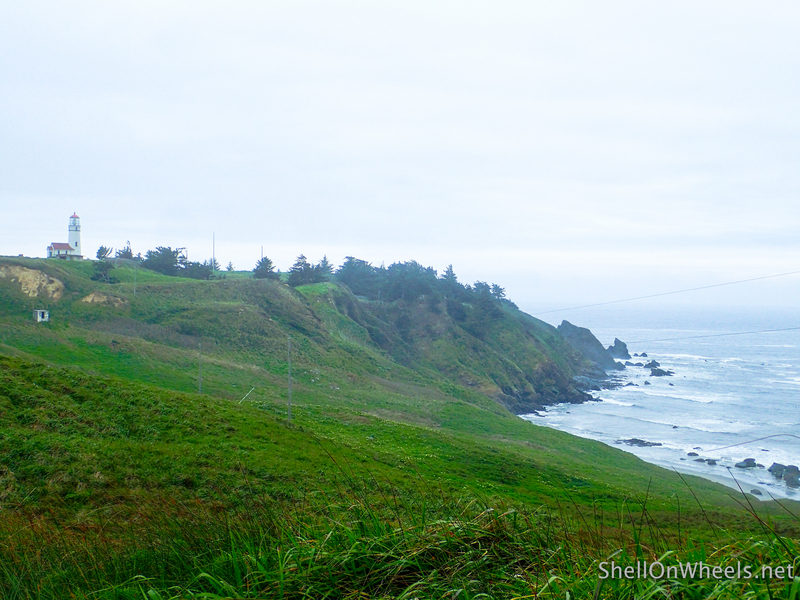 From the multiple sources we researched, Cape Blanco was almost always on the top of the list for the southern portion of the coast line, and after three days of exploration, we see why. It is just fantastic, starting with the spacious sites with 50 amp electricity, water picnic table, and fire ring. We circled the whole park, checking each of the 50 plus sites, finally selecting this excellent one that has an actual view of the ocean through the trees. This convinced us to pull in front forward rather than back in as is usual, and sometimes mandatory, allowing us to continuously enjoy the view from our large front window. The park has a great set of easy trails, particularly the Coastal Trail just 100 feet in front of our bus, which leads down to the beach access in one direction and to a fantastic lighthouse a mile away in the other. The weather was not always fantastic for us warm weather oriented Floridians, but the chill of the morning gave way to reasonably sunny afternoon on the first day, and with 50 amp electricity we were able to run a heater at night. Even with the weather shifting from sunny to cloudy after the first day, such changes provided for a significantly different views each day from the beach. The park has very clean toilet and shower facilities with plenty of hot water, paved rads, level sites, and even reasonable Verizon connectivity, which was a relief since we had virtually none in Jedediah Smith Redwood campground. As for supplies, the nearest town and stores are rather farther away than is comfortable for a bike ride, so unless you have a tow vehicle stock up before you arrive. If there is any ding on Cape Blanco State Park, it is the lack of a dump station. We are used to sewage hook ups being rare in state parks, but almost all of them have a central dump station, so it came as a surprise when we didn’t spot one coming in to Cape Blanco, and were informed by the camp hosts that it had been inoperative for eight years. Considering how well maintained the rest of the park is, I have come to suspect that having no sewage facilities on premises is an intentional decision of park management, a feature not a bug, that fits in with what seems to be the incentivization of a “pack it in, pack it out” mentality here. Another example: almost no trash cans anywhere in the public picnic areas and trails. People are expected to take any trash they bring or create out of the park them. Yes we are darling 😀 See you soon!!! Glad you’ve enjoyed Cape Blanco. We volunteered as tour guides there two years in a row, and just love it there. Looks like they’re repainting the stair case? Cool! Yes it was a great park, I can understand repeat volunteering there.